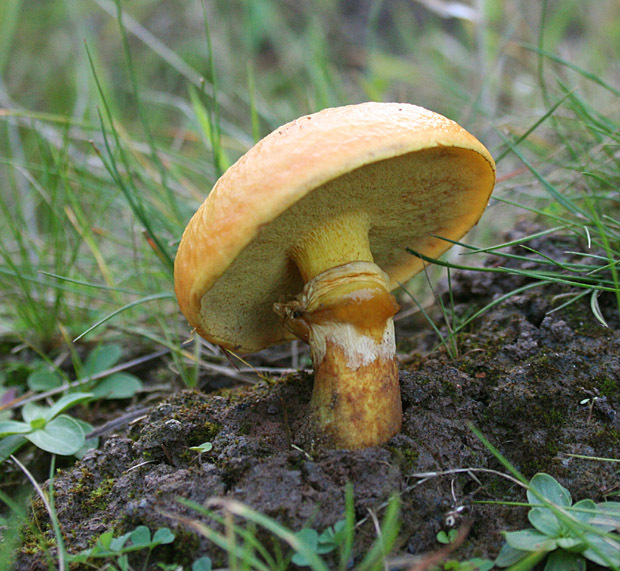 cap is up to 15 cm broad, golden yellow to orange-red, smooth, sticky, slimy when wet. older specimens are deep chestnut-red. underside of cap has a spongy surface of yellow pores that are arranged radially; pores bruise brown. flesh in cap flushes faintly lilac when cut. young specimens have partial veil that leaves a yellow/red ring on the stem. stem is solid (not hollow), yellowish above the ring and streaky reddish/brown below. mature specimens have a faint net pattern above the ring. grows in groups near larch trees. appears in summer and fall. has a mild taste and odor; peel away the slimy skin layer before cooking, since it is known to cause gastro-intestinal upset.